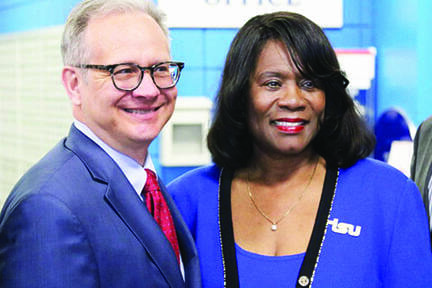 NASHVILLE, TN — Tennessee State University President Glenda Glover Monday welcomed new Nashville Mayor David Briley to the TSU campus. The mayor stopped on campus to meet with “the TSU family” and to promote the city’s new transit initiative, a $5.4 billion proposal to build a light rail system and rapid bus transit for Nashville over the next 15 years. Symbolically, the mayor arrived aboard a Music City Circuit bus that serves key destinations in Nashville between the Riverfront Station and the TSU campus free of charge. Briley took pictures and had lunch with TSU administrators, faculty, student leaders and staff in the main student dining area in the Campus Center. “I just took the Circuit bus over here from downtown to Tennessee State University,” said Briley, adding that the service has seen a 50 percent increase in ridership since its inception about a year ago. Glover said she was glad that TSU was invited to be a part of the plan to draw up the transit proposal. Briley said with the increased ridership, bus service on the TSU route will see an immediate increase to 20 hours a day from its current 16 hours. 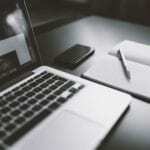 “This is typical of the kind of increase you will see across the community – greater access, longer hours and more frequent service – immediately when the initiative is approved. We want to make sure it is accessible, it’s affordable, reliable, and a consistent service for everybody who needs it here in our community,” the mayor said. JerMiiton Woods, president of the TSU Student Government Association, said many TSU students use public transportation.